One of the few vegetables we still eat more or less seasonally is asparagus. Fresh asparagus has firm, crunchy, vibrant spears. Hold the spear at either end and snap it; the break will take place where the tough part becomes tender. Discard the ends, as they will be often be too dry or tough to eat. I love it roasted as this slightly chars and caramelises the spears and brings out flavours you can lose by boiling it. I always pop some in the oven while a roast chicken or leg of lamb is resting. Use the thicker spears when roasting. Trim the asparagus. The easiest way is to hold the spear at either end and snap it; the break will take place where the tough part becomes tender. 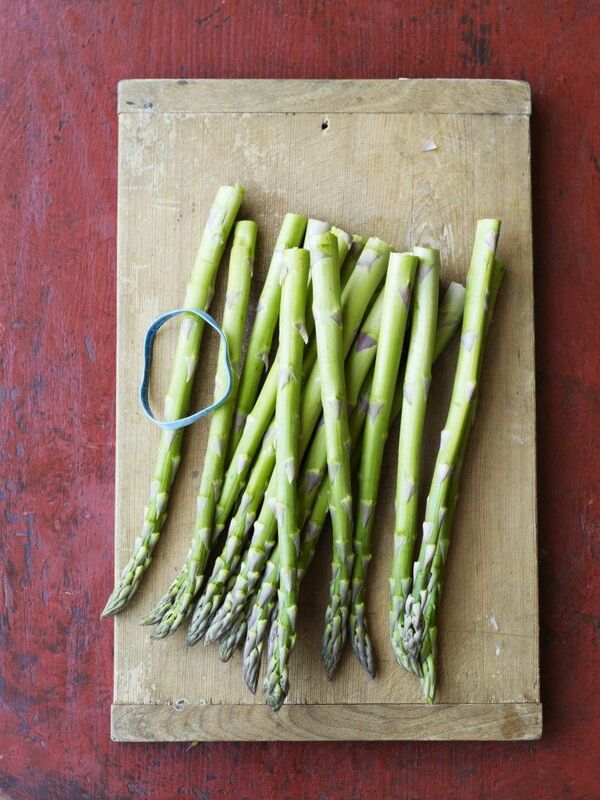 Lay the asparagus in a single layer in a roasting tin. Lightly drizzle or brush with some oil. Sprinkle with a little crushed garlic (optional) and season well with salt and pepper. Roast in a preheated 200C oven for about 15 minutes, depending on how thick your asparagus spears are, until lightly browned and tender when pierced with a sharp knilfe. Drizzle with a little fresh lemon juice or balsamic before serving, if desired. Brush the asparagus with a little olive oil and roast for about 15 minutes in preheated 200C oven, until tender and slightly charred. 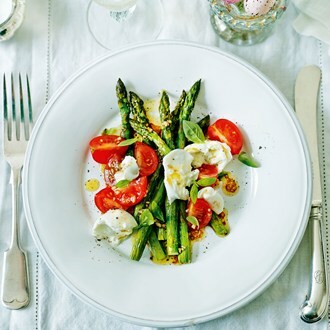 Meanwhile, place the mozzarella and cherry tomatoes into a bowl and pour over the 2 tbsp olive oil 2 tsp balsamic vinegar and the finely grated zest of half a lemon. Mix well and set aside. Separate the lettuce leaves. Divide the lettuce leaves between four plates. Top with the warm asparagus and then top with the mozzarella, breaking them slightly into pieces, the tomatoes and the juices. Season with salt and pepper. Serves 4 as a light meal or entree. Place the bulgar wheat in a bowl and cover with 450ml boiling water. Soak for 30 minutes then drain and squeeze out excess water by placing the drained bulgar in a clean cloth and squeeze tightly. 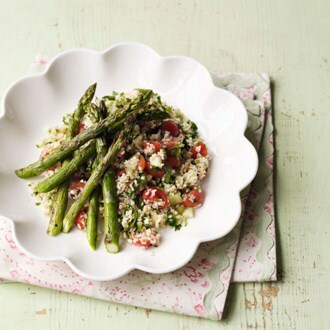 Combine the bulgar wheat, parsley, mint, tomatoes, cucumber, garlic, spring onions and lemon juice in a large bowl. Season well with salt and freshly ground black pepper.